It was the Canadian writer, Naomi Klein, who invented the term “disaster capitalism” to describe what she identified as a deliberate strategy to use the opportunity created by the shock of natural disasters, social dislocation or economic failure to force through “free-market reforms”. She first recognised the phenomenon in the case of 1970s Chile under Pinochet, but there have been many instances since; societies suddenly confronted with unexpected crises have been forced, as the price of being bailed out by private capital or – just as commonly – by international agencies like the International Monetary Fund, to accept the prescriptions insisted upon by their supposed saviours. The outcome in almost all such cases has been the adoption of “structural reforms” – a euphemism for asset sales, privatisation, deregulation and “free-market” economic policies which have done little to help the economies concerned but have provided rich pickings for powerful financial interests. It may come as a surprise to some to realise that we have not been immune to such developments in New Zealand. The Christchurch earthquakes have provided just such an opportunity for the pursuit of objectives of a political rather than economic nature. It was announced last week that the Christchurch City Council was about $900 million in the red, as a consequence of the reconstruction burdens it has had to assume as a consequence of the earthquake damage. The only solution, it is asserted, is that the Council must sell a large proportion of its existing assets, and it seems that – despite its long-standing opposition to such a course – the Council has reluctantly accepted its inevitability. There are several reasons for regarding this as an instance of the “disaster capitalism” described by Naomi Klein. Such sales have been resisted by the Council in the past, as they usually are by most public authorities – and, in the case of our national assets, by most New Zealand voters – because they are seen to be bad business; they may seem to resolve a short-term problem but they ensure, through the loss of revenue-producing assets, a longer-term loss of major income streams and a consequent hole in the accounts which can only be made up by future generations of ratepayers or taxpayers. The sale of assets is, however, very much welcomed by those private financial and commercial interests who see the chance of exploiting a short-term difficulty for their own private gain. The transfer of these assets into the private domain ensures that revenues that once went into the public purse will now be diverted into profits for a small group of shareholders. Not surprisingly, the assertion has been eagerly welcomed by the city’s Chamber of Commerce; indeed, we are already told that the proposed sale of about a quarter of the Council’s assets will not be enough and will have to be followed by yet further sales. Yet we might wonder why it is that the City Council is to be left alone to bear the burden of finding $900 million. Surely the cost of the damage caused by the earthquake disaster is on such a scale that the people of Christchurch cannot be left alone to meet it by themselves; and make no mistake, that is what they are being asked to do – every dollar of the revenue lost through asset sales will have to be covered by Christchurch ratepayers for years to come. Rather than look for national solutions, such as the kind of credit creation for national purposes that we would naturally turn to in wartime, we are being asked to endorse a barely concealed step towards further privatisation. And bear in mind that Canterbury has already seen a similarly significant political development in the replacement of the Canterbury regional authority by a government-appointed board with a remit to ensure that water resources are made available, whatever the public interest, to allow for a major expansion of dairying. Supposedly immutable economic factors, in other words, are being used to push through supposed and politically inspired “reforms”, based on “free-market principles” that are not supported by most New Zealanders. 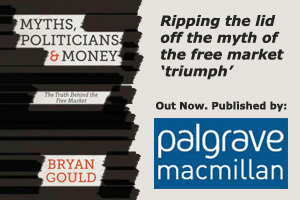 And, if we examine closely the government’s drive to cut public spending, we can see that the pattern is constantly repeated; it is often not just an economic outcome that is sought but a political one as well. By putting public sector entities under financial pressure, for example, the government not only saves money but is able to force structural changes too – the tertiary education sector is a case in point. And the public purse can also be used to ensure that non-government bodies that might jib at complying with the government’s wishes can be kept in line – the Problem Gambling Foundation and Fish and Game are recent instances. Paradoxically, this course is pursued at the very time that the government has had to step in to pick up the pieces of private sector failures like those of Novopay and the TV set recycling company RCN. The proper balance between public and private provision is not, it seems, as straightforward as the government seems to assume. Borrowing from the Reserve Bank would seem preferable to selling assets; however, one would have to wonder if overseas banking interests would retaliate in some way, as this type of policy would seem detrimental to their interests. Thanks Brian. The Green party temporary tax increase would have been another solution. Another solution would be allowing regional or local government a bigger/wider tax base which would help Canterbury pay for the public side of the rebuild. Canterbury’s economy despite the earthquake is actually quite strong -the rural side was basically unaffected, most urban based business have adapted and the construction sector is the strongest in the country. The problem we have in Canterbury is entirely the result of the various government rebuild institutions being unnecessarily financially squeezed.